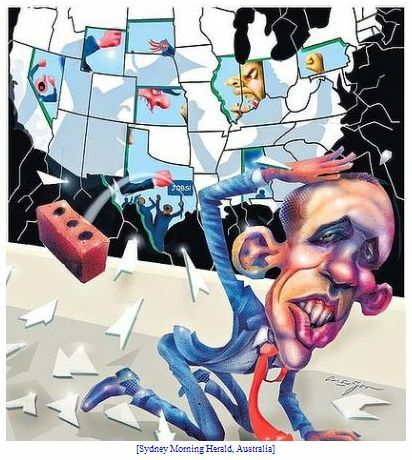 The American left isn’t the only left angry at President Obama – just a day before the 2010 midterm elections. So what’s the takeaway lesson for Obama from what looks to be a big pick-up for Republicans? According to Swiss columnist Regula Staempfli, it’s that playing footsie with people that want you politically dead was a foolish strategy from day one. Considering the dumbing-down, weapons glorification, and contempt for humanity shown by populist racist right-wing radio stations and Fox TV since the non-election of the world’s worst president, George W., this presents a small glimmer of hope. But it’s exceedingly tiny. And president “yes, we cannot” Obama isn’t entirely without blame. After all, if the companies he rescued, banks he saved and restored perfectly, multinational companies he didn’t punish, pharmaceutical companies he coddled and Wall Street bankers he himself appointed to government are handing out millions to his political opponents with the goal of restoring power to the political forces which drove America and the world to the brink of ruin – then one must speak of blame with respect to Obama. Instead of seizing a unique historical opportunity after his election, as Roosevelt did in 1933 with the New Deal, Obama sat at the same table and discussed marriage with his political assassins for two years. Of course, he did so with precisely the level of success we thinking folks predicted (see also Paul Krugman or Joseph Stiglitz): assassins want to kill you – not marry you. Instead of discussing acceptable bonus numbers with former Goldman Sachs employee Timothy Geithner, Obama should have read more history. “Shambles” is a fair term for the state in which the U.S. and in no small measure Europe, now finds themselves after two years of the Obama Administration. READ ON AT WORLDMEETS.US, your most trusted translator and aggregator of foreign news and views about our nation. Log in for continuing updates on the U.S. election and attempted terror attack.